Vitamin A is essential for the maintenance of healthy epithelial tissue, which is found in the eyes, skin, respiratory system, GI and urinary tracts. Vitamin A, also called retinol, helps your eyes adjust to light changes when you come in from outside and also helps keep your eyes, skin and mucous membranes moist. Vitamin A mostly comes from animal foods, but some plant-based foods supply beta-carotene, which your body then converts into Vitamin A. It also has antioxidant properties that neutralize free radicals in the body that cause tissue and cellular damage. Scientific studies have demonstrated that beta-carotene is helpful to people who already have Coronary Artery Disease. 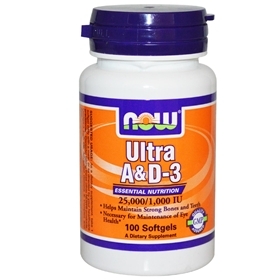 Suggested Usage: As a dietary supplement, take one softgel daily, preferably with meals. Consider taking this product in combination with NOW® Omega-3 Fish Oil, Tru-E BioComplex™ and Zinc.